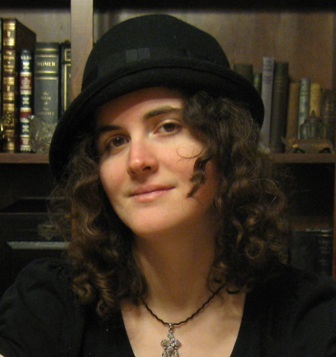 For my fourth—and final—2015 spotlight for Women in Horror month, I would like to introduce author Scarlett R. Algee. This Renaissance woman is not only an amazing writer, but also a jewelry maker, a slush pile reader for Sanitarium Magazine, and, of course, a major devotee to Cthulhu. Could we adore this lady any more? Earlier this month, Scarlett was kind enough to share some details on her artistic process as well as her insight into everything from writing and reading to steampunk and elder gods. A couple icebreaker questions to start: when did you first realize you wanted to be a writer, and who are some of your favorite authors? My first exposure to writing came when I was in first grade. My teacher taught spelling and handwriting by giving us a list of words and having us create little stories using those words. (I’m sure my mother still has those somewhere.) That was the beginning of learning to tell myself stories, complete with acted-out performances by Barbie and friends. It wasn’t until a few years later that I realized people actually got paid to write things down, but by then I was already hopelessly smitten by the process. Favorite authors…oh gosh, I have to pick? Poe and Lovecraft, definitely; I return to those two time and time again. Rudyard Kipling, because I’ve always wanted to live in British India. Clark Ashton Smith, because he could write both beautifully lyrical fantasy and remarkably disturbing horror. Stephen King, whose book “On Writing” should be required reading for everyone. And Terry Pratchett, who taught me that a story can be uproariously funny and yet deeply, seriously moving. 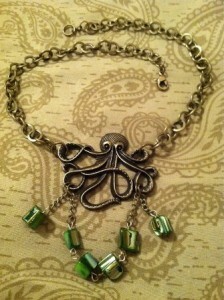 How do I write a Cthulhu haiku (or any other kind of haiku)? Get an idea, brainstorm until I think up some phrases that sound good, and then beat them until they fit the meter :). A lot of people think haiku is an easy form of poetry to write, because the end result is so short. They’re wrong. It can be very frustrating trying to pare a line down to five or seven syllables. In addition to writing, you’re also an accomplished jewelry maker. How do you balance two vastly different art forms, and has inspiration from one ever overlapped with the other in unexpected ways? Jewelry and writing: balance them by keeping them as far away from each other as possible! That’s easier than it sounds, because most of my jewelry pieces are created in an hour or less, while writing is an ongoing, daily, dead-of-night process. Another thing that helps with the balancing act is that once I create something, physical or written, it gets put away for a while, and I give myself time to switch gears. There hasn’t been any significant overlap yet–I’ve done a *little* steampunk writing, though horror is definitely where my heart lies–but I’m open to the possibility. Are there any particular themes you return to again and again as an artist? My jewelry is entirely steampunk, so there’s a constant revisitation of the concepts of progress, of technological advancement, of discovery. Clocks, compasses, and cogs: the measure of human achievement, but also the measure of human mortality. With writing, it’s a bit more personal. I have a form of chronic lung disease which, over the years, has meant a lot of time in hospitals and, occasionally, in operating rooms. The themes I find myself coming back to, time and again, are medical: drugs, experimentation, surgery. l’ve dabbled in some pretty dark corners–vivisection, anesthesia awareness, medical zombification. The human body is a fascinating piece of work, especially with the peel off. In what directions would you like to see your horror career go? More published short stories? Novels? A multimedia project incorporating both jewelry and fiction? All of the above? For the foreseeable future, I’m aiming for more published short stories–I feel I’m a better “short” writer than a “long” writer, though I try to reach a little more each time, to eventually work up to a good “long” story. I have a few story ideas on file that may become novels, but my immediate goal is to get into an anthology or two this year. What upcoming projects are you planning? Oh, projects! I’ve just finished a novella (it’s a riff on that “medical zombification” idea, with some light steampunk elements), and that’s being proofread as we speak. I’ve also recently rediscovered two Lovecraftian short stories I wrote years ago, and they’re my current project; I’m polishing them up in hopes of getting them published. The next thing I have planned is a story that deals with the treatment of psychiatric patients in the early 20th century–the plot runs deeper than that, of course, but it’s requiring a *lot* of reading and research. And, last but not least, I’m tinkering with interactive fiction. The 2015 Interactive Fiction Competition opens on 1 July and I hope to have a serviceable game created by then. It will almost definitely involve horror. Thanks again to Scarlett for participating in our Women in Horror Month spotlight. You can check out her jewelry work at her Etsy shop at copperwalkdesigns.etsy.com. 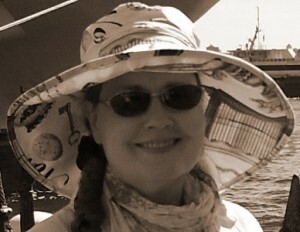 As for her writing, be sure to visit her blog at sralgee.wordpress.com where she shares all the latest updates on her burgeoning fiction career. This is one writer who most definitely earns the Cthulhu seal of approval. Happy reading, and enjoy the rest of Women in Horror Month! This entry was posted in Fiction, Interviews and tagged Sanitarium Magazine, Women in Horror Month on February 26, 2015 by gwendolynkiste. 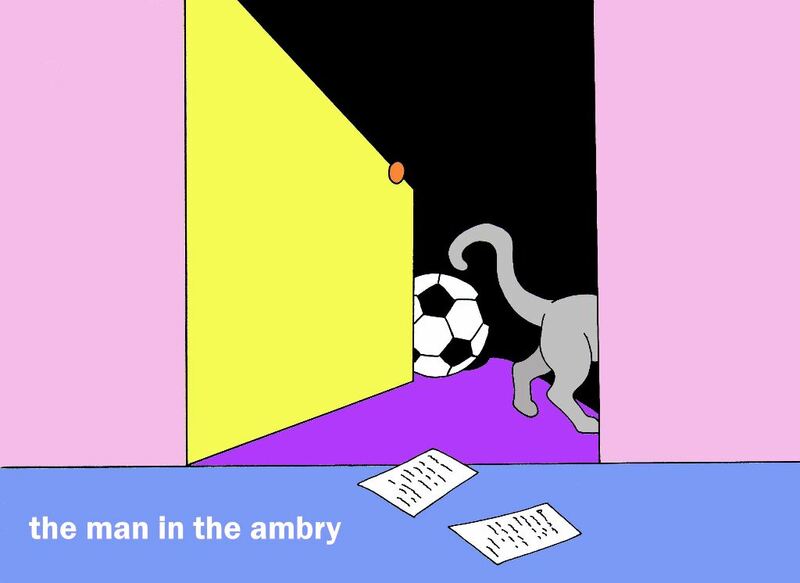 Last month, my short story, “The Man in the Ambry,” made its debut in Typehouse Literary Magazine. I remember quite vividly receiving the acceptance letter: it came on Thanksgiving Day, giving me one more thing for which to be exceptionally grateful. Letters are of the utmost importance to this conversation, seeing that “The Man in the Ambry” unfolds through a series of letters written by a young girl and delivered to the creature living in the walls of her family home. Epistolary fiction–that is, stories that use documents, be it diary entries, blogs, or regular old send-in-the-mail letters–isn’t quite as popular as it once was, but the format remains one of the most tried-and-true of the horror genre. My personal inspiration for writing “The Man in the Ambry” came after I recently reread Richard Matheson’s “Graveyard Shift.” Matheson’s 1960 story unfolds through correspondence between two family members who are trying to make sense of what happened to a little boy and his now-deceased mother. It’s a pithy little tale–only four pages–but the diminutive length in no way diminishes its effectiveness. But Twilight Zone scribe Matheson was neither the first nor the last to use the epistolary form in the name of horror. The earliest devotees to the narrative-by-letter format would be Bram Stoker’s Dracula and Mary Shelly’s Frankenstein. That’s right; the epistolary form has pretty much been around as long as horror literature has. If counting two of the original genre stories in your corner doesn’t earn respect, then nothing can. And it wasn’t just 19th century writers who loved epistolary. Everything from Stephen King’s teenage-angst-gone-wild Carrie to Max Brooks’s World War Z includes letters, interviews, and/or newspaper articles as storytelling devices. These days, the epistolary format has morphed to reflect new technology. You can find a variety of twenty-first century stories that use tweets, blogs, and other social media to tell gruesome and otherwise macabre yarns. For as long as there’s horror literature, epistolary will be there, lurking around corners and in mailboxes to haunt your nightmares. This entry was posted in Fiction on February 24, 2015 by gwendolynkiste. As part three of my Women in Horror Month author spotlight, I present to you the one-of-a-kind Brooke Warra. I met Brooke through the Sanitarium Magazine Faculty forum. After we were both published in the magazine, she and I joined a group of “doctors” who help editor Barry Skelhorn field incoming submissions. Since meeting Brooke, I have been repeatedly impressed with her professionalism and dedication to her craft as well as her wit and down-to-earth nature. Consequently, I decided I just had to feature her on my site. She was kind enough to oblige and answer a few of my questions. Okay, some icebreakers: when did you first realize you wanted to be a writer, and who are your favorite authors? I don’t ever remember not wanting to be a writer. My parents often joke they should have gotten a typewriter tattooed on my forearm at birth. I remember writing ghost stories for my friends in elementary school- my parents fielded a couple calls from concerned mothers about that–ha! It’s so hard for me to pick my favorite authors! The easy answer is Stephen King, and I have read every book he has out, including his non-fiction. I spend a lot of time re-reading my favorites from childhood–R.L. Stine, Shel Silverstein, and a giant collection of Scandinavian fairy tales. I think the influence of these stories shows quite a bit in my writing. You recently posted on your author page about working at a daycare. Since children have been the inspiration for some seriously creepy stories, does your proximity to a large group of kids ever inform your horror writing? Kids are a great inspiration for my writing. They live in this world that is completely new to them, everything is a mystery and magic still exists. You tell them the dollar under their pillow is from the Tooth Fairy and they just accept that as a fact. I think a lot of my stories are like that. When I am storytelling, I’m asking you to let me suspend your reality for a bit and let me lead the way through the deep, dark forest. Childhood in general is a huge inspiration in the way I tell a horror story but make no mistake, my stories are definitely not for kids! Fiction writing can be a very diverse trade, especially when dealing with fantastic topics like horror. Are there any themes or threads that connect all your work? I’m really fascinated with my Finnish heritage and like to include little clues about that in my stories. I love writing with mild undertones of fairy tales. Also, I was born with birth defects and raised in a small fishing village in Washington State where I was the only kid with a physical disability in the entire school. So, my monsters always have a connection to their humanity. I create monsters because I have a deep affection and understanding for them. Of my published pieces, I’d have to say “Sleepyhead” (published in the December issue of Under The Bed Magazine) is my favorite. When I was growing up, I used to listen to old loggers telling stories about horrific on the job accidents, really gory stuff. That, coupled with the scenery of my hometown, the dark woods, the swamps, the stories we told each other as kids about the things that lived in those swamps, the cruelty of children, all came together in that story. I also love the readers’ reactions to the ending, every time. In what directions would you like to see your horror career go? 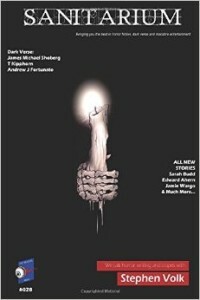 More published short stories? Novels? Nonfiction? All of the above? Definitely more published short stories! That has always been my first love. But of course, I have a writer’s ego and I think there is a novel lurking in my brain as we speak. I’ve actually outlined one! A talented friend of mine is working on a youtube project (think of the days when kids sat around the radio in the living room to listen to dramas complete with actors and sound effects) that I’d really love to be a part of. That’s still in its infancy, right now. Right now I have several projects going. I’m working at getting a blog up and running. My main goal over the next year is to finish a collection of short horror pieces–but in that collection there will be several stories that are all tied together, sort of like a novella hidden inside the book of short stories. Big thanks to Brooke Warra for answering all my macabre questions. Be sure to check out her Facebook author page where she posts everything from writing advice to creepy, cool pictures. And of course, stay tuned for the upcoming issues of Sanitarium Magazine where Brooke, myself, and a whole host of other talented writers help field the inmates! Until then, happy reading, and happy Women in Horror Month! This entry was posted in Fiction, Interviews and tagged Sanitarium Magazine on February 18, 2015 by gwendolynkiste. As the second installment of my Women in Horror author spotlight, I once again had some help from editor Sarah Glenn. She introduced me to the versatile Kristin Roahrig. Ms. Roahrig’s latest story, “Sputter from the Flames,” appears in Mystery and Horror, LLC’s newly released History and Mystery, Oh My! Based in ancient Rome, Roahrig’s tale follows a woman searching for answers in the death of her niece. Was it indeed a suicide by wolf’s bane? Or was there something–or someone–else to blame? The beautiful setting belies a truly timeless quest for the truth after the loss of a loved one. 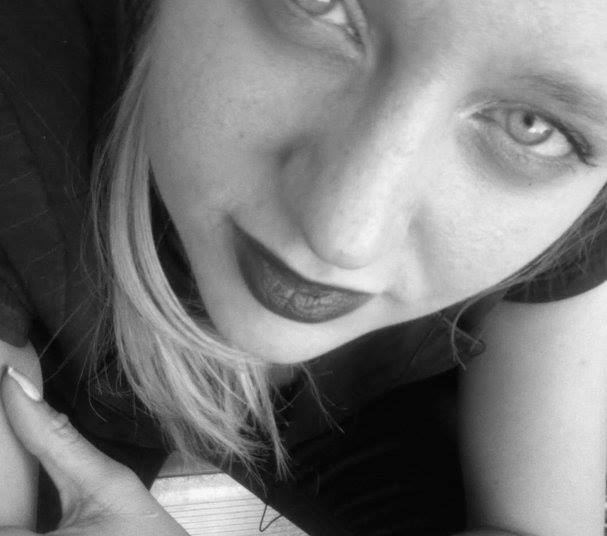 In addition to History and Mystery, Oh My!, Kristin Roahrig’s poetry and short stories have appeared in various publications, including The Horror Zine and Indiana Horror Review. She is also the author of several plays. A current resident of Indiana, Ms. Roahrig is most definitely a horror and mystery writer to keep your eye on. Sarah shared this interview she recently did with Kristin as the two discussed writing and upcoming projects. As long as I knew how to write I’ve always written, whether it was plays, poems, or stories. I never considered writing as a possible profession, it was only something I enjoyed. It wasn’t until I was in my early twenties that I realized that I would actually like to be a writer and be a part of that field. My inspirations can be found in all sorts of places, sometimes they have even come from footnotes in nonfiction books. For the story “Sputter From the Flames”, the first concept I had for the story was the setting and time period. I am currently working on a young adult novel that takes place during the Salem Witch Trials. The novel was originally inspired by an ancestor’s involvement with the trials through the jury. You can read Ms. Roahrig’s story, “Sputter from the Flames,” along with nineteen other mysterious tales in History and Mystery, Oh My! The book is available now at Amazon and Smashwords. This entry was posted in Fiction, Interviews and tagged Mystery and Horror LLC on February 13, 2015 by gwendolynkiste. If you haven’t already caught my other recent articles, then I am quite excited to inform you that February is Women in Horror Month. This auspicious occasion is a perfect opportunity to discover new female horror writers. So for my dose of great fiction, I turned to Sarah Glenn from Mystery and Horror, LLC. She and her partner Gwen Mayo (another Gwen! serendipitous, right?) 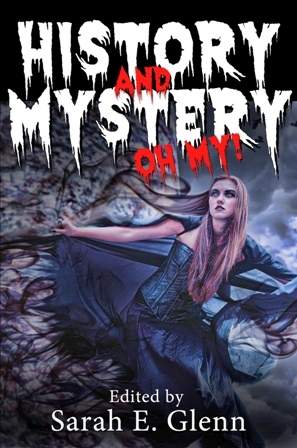 have just released History and Mystery, Oh My! This is the companion piece to History and Horror, Oh My!, and both anthologies focus on historical genre fiction. 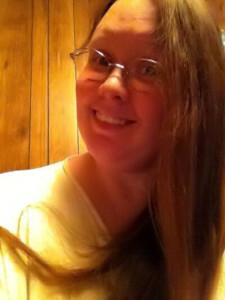 Sarah shared with me an interview she recently did with Rosalind Barden, which appears below. But first off, who is Rosalind Barden? A very successful writer, that’s who! Her stories have appeared in numerous anthologies, webzines, and competitions, including Shriekfest Film Festival. Also a talented artist, she wrote and illustrated the children’s book, TV Monster. Prolific and diverse, Barden’s darkly humorous novel, American Witch, is available now at Amazon. She currently resides in Los Angeles, California. I’ve always been drawn to Los Angeles’ Bunker Hill, though it was only later that I learned its sad history. The place is like a vanished dream. I would have loved living there. “The Monkey’s Ghost” grew out of my haunted feelings about what has been forever lost. But not to worry–the story still has plenty of funny bits! I’m tinkering with drabbles, short stories of exactly 100 words. This January 13, Specklit.com posted my drabble, “The Human Dynamo Theory,” and will post my “Flight of the Guinea Pig” on February 16. Specklit.com posts a drabble every other day. I enjoy seeing how other writers craft full blown stories of only 100 words. It’s fascinating. And coming up is my short story– much longer than 100 words–“The Demon of City Hall” in Mystery and Horror, LLC’s anthology, “Strangely Funny 2 1/2.” I love writing satire, and this story is a city hall full of satire! Okay, so you’re an author. What do you enjoy reading? I have so many favorites and I am always reading. Short stories are the perfect bedtime “treat” for me, and Mystery and Horror, LLC provides plenty of satisfying short story anthologies for my noshing. I am a P.G. Wodehouse fan and enjoy his humorous mystery short stories in “Wodehouse on Crime.” I read book-length stories too, fiction, non-fiction–whatever catches my curiosity. Most recently, when I was in Santa Fe, I picked up “The Harvey Girls,” and learned about the adventurous young women who worked out West in the Harvey House railroad hotels. Sounds like my kind of job! The Harvey Houses are another vanished world, like Bunker Hill, so I suppose my dreamy thoughts pull me toward the hopelessly gone. (Still waiting for Vaudeville’s return!) Fortunately, Santa Fe’s beautiful La Fonda is a surviving Harvey House. I endured the bout of freezing weather during my visit, snug by the lobby’s fireplace, wineglass at the ready, writing away, while the friendly staff made sure I stayed comfy. Can’t get better than that! You can read Ms. Barden’s story, “The Monkey’s Ghost,” along with nineteen other mysterious tales in History and Mystery, Oh My! The book is available now at Amazon and Smashwords. This entry was posted in Fiction, Interviews and tagged Mystery and Horror LLC, Women in Horror on February 6, 2015 by gwendolynkiste.